We all know there are two sides to every story under the sun and that includes the controversial issue of owning and caring for exotic animals. Some creatures that fall within this category might be more suitable and less dangerous than others, but for the most part, exotic animals do not make good pets, and lions, tigers, wolves, primates, bears and reptiles do not thrive outside their natural habitat. Why don't exotic animals make good pets? The average person cannot provide the specal care, housing and maintenance that exotic animals need in order to flourish as living things. Often they suffer at the hands of private individuals due to malnutrtion and inadequate housing, and they can be very dangerous both to the safety and health of those in their proximity. These animals are wild and meant to be free; cages bruise their souls and crush their spirits. In the forefront of those pushing to end the private ownership of wild animals is a non-profit organization called Born Free USA. According to My Health News Daily, this advocacy organization has documented 1,500 attacks, including 75 human deaths caused by exotic animals since 1990. There have also been more than a few harmful if not fatal confrontations, including an incident in Texas where a four-year-old boy was hospitalized after being mauled by a pet mountain lion. Society at large has much to fear from exotic animals that are not properly cared for. When these animals are isolated from others of their kind and forced into small enclosures unable to roam freely, over time they can and often do detonate with all the deadly force of a hand grenade. Many exotic animals are carriers of diseases, such as Herpes B, Monkey Pox and Salmonellosis, all of which can be transmitted to humans. The problem with keeping large cats as pets is that they are completely unpredictable. They can be friendly and loving one minute, and in an instant ferocious and deadly. While lions, tigers, leopards and cougars are adorable when they are kittens, their potential to kill or maim people and other animals as they grow cannot be ignored. According to veterinarian, Terry Mattive of T & D Mountain Range Menagerie, a sanctuary for unwanted, abused and exploited jungle cats in Penn Creek, Pennsylvania: "People buy these large cats when they are kittens and dont' have the foresight to see in four years that kitten is going to weigh 500 pounds, and instead of two bottles it is going to need 30 to 50 pounds of meat a day. They try to make a pet out of something that will never be a pet." 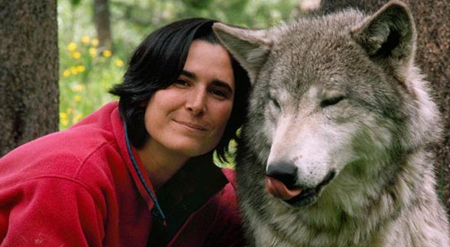 The US Endangered Species Act of 1973 prohibits the possession of pure wolves. For the most part, despite the image above, pure wolves are unpredictable and can become aggressive towards small animals and children. Their predatory behavior is genetically coded and although it can sometimes be suppressed, it can never be eliminated by socialization or training. Wolves are pack animals and although they are often shy with humans other than their owners, even when they seem friendly they have been known to attack people as they would other wolves in certain situations. Monkeys are the most common primates owned by private individuals. In one instance, Judi Zazula, an occupational therapist and rehabilitation engineer, founded an organization back in 1979 called Helping Hadns-Monkey Helpers. 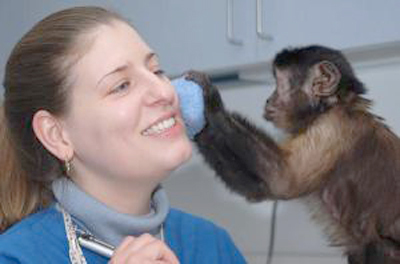 The organization trains monkeys to help paralized or otherwise disabled individuals to "eat, scratch an itch, reposition a hand or a foot after a muscle spasm, assist with use of a telephone and computer or handle a DVD." The training takes between 18 and 24 months and costs $35,000 per monkey. Since its inception, the organization has trained and successfully placed more than 100 monkeys. Monkeys can be very affectionate pets but can become extremely agressive upon reaching two years of age. Males particularly have been known to establish dominance, but females bite to defend themselves as well. 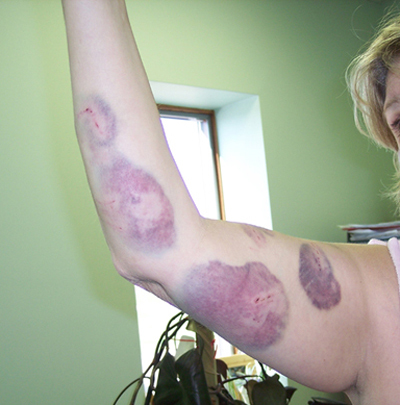 Monkey bites can cause severe infections that can penetrate the bone and result in permanent deformity. Yet, to date, there is very little research that has been done on the subject. According to the Center For Disease Control (CDC), many owners of pet macaques don't report attacks and bites for fear that the animal they love will be taken away and euthanized. Monkey bites are serious business such as ilustrated above.The woman pictured not only had the canine teeth removed on her pet capuchin, she had raised it from that time it was an infant abandoned by its mother. In her own words: "The nerves in my hand and wrist were so severely severed that i will likely never regain use despite all of the surgeries I have endured." Harmless to monkeys but often fatal in humans is the Herpes B-Virus or Simian B. Between 80 to 90% of all macaque monkeys are infected with Herpes B, which generally occurs when the animal is ill, under stress or during breeding season. There has never been any kind of scientific study detailing the frequency of the Herpes B infection in humans, making it extremely difficult to calculate how mnay people have actually been affected. Those who live with or work with infected monkeys are at risk for contracting the virus. 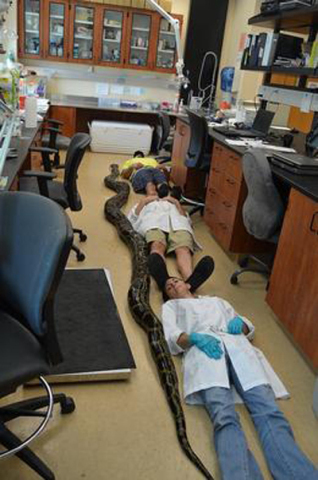 About 3% of American households posses 7.3 million pet reptiles with snakes being the most common. According to the University of Florida, more than 7,000 venomous snakebites are reported annually in the United States, 15 of which result in death. (It is not known how many of these bites were made by snakes that were pets.) Most pet snakes lead very cramped lives in tanks so small they can't even stretch out. Pythons, boa constrictors, anaconda and other large snakes are capable of killing an adult human, and they should not be kept as pets. 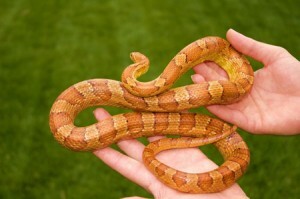 Corn snakes, like the one indicated below, on the other hand, make wonderful pets and are very popular. It is estimated that 90% of all reptiles carry and shed salmonella in their feces. Iguanas, snakes, lizards and turtles are common carriers of the bacterium, which does not at all affect the animals's health. In humans, it can cause severe diarrhea, headache, malaise, nausea, fever, vomiting, abdominal cramps and even death in some instances. Individuals who eat after failing to wash their hands properly after handling a reptile or objects the reptile contaminated are subject to this malady. Although the American Veterinary Medical Association, the United States Department of Agriculture (USDA) and the CDC have all expressed opposition to the possession of certain exotic animals, in some instances such adoptions do work, with best results occurring with wild birds such as parrots and macaws. Generally speaking, a genuine bond can occur when individuals possessing exotic animals do not attempt to alter their nature or their environment. Animal Planet has featured several true life examples where wild animals have integrated positively with their human caretakers. 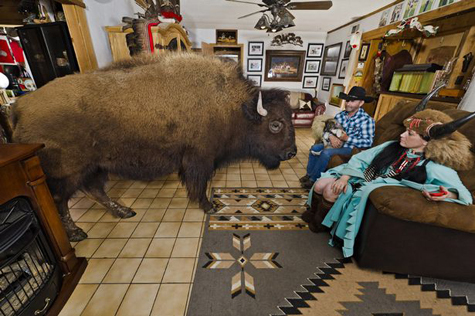 Wilfd Thing, featured above, is a buffalo that roams free on aTexas farm with house privleges. He is destructive, but his owners accept his nature for what it is; that of a wild beast. 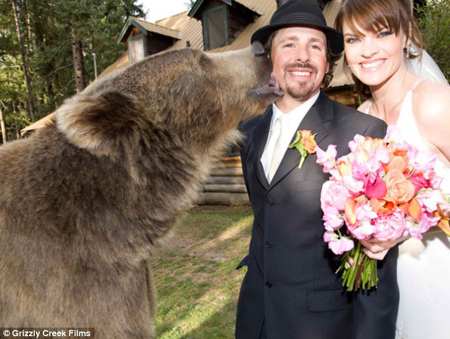 In a similar story, a grizzly bear named Brutus served as best man at his caretaker's wedding. Although there are laws governing the ownership and sale of exotic animals, regulations are not standardized: they vary from community to community. For this reason, no one can say how many exotic animals are owned privately in the United States. 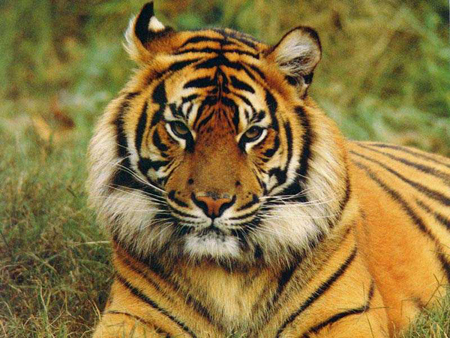 Estimates are staggering; 6,000 to 7,000 tigers alone. 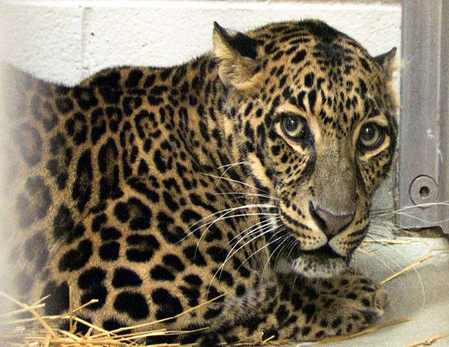 There are three federal laws that pertain to the possession of exotic animals. They are: the Endangered Species Act, the Public Heath Service Act and the Lacey Act. Their limitations are that they only regulate the importation of exotic animals into the United States and not private possession. State laws have the auhtority to regulate ownership, although there are variations between them. The private possession of large cats, wolves, bears, monkeys and dangerous reptiles is banned in thirteen states. They are: Vermont, Utah, Arkansas, New Hamshire, California, Colorado, Georgia, Maine, New Jersey, New Mexico, Tennessee, Wtyoming and Hawaii. Other states have partial bans and still others neither prohibit nor require a license or proof that an exotic animal was legally acquired. Local laws are stricter. It is the City or County Council that determines the threat to the health, safety and welfare of its residents, but some skirt the law by getting licensed as breeders, rezoning their property or moving elsewhere. Few things are easier than buying an exotic animal over the more than 1,000 sites on the Internet. Of course, there is never any mention of laws regulating possession or the importance of understanding the needs of the animal they are selling. 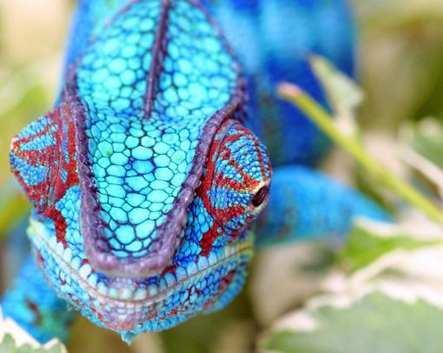 Unfortunately, the exotic pet trade is big bussiness and one of the largest sources of ill-gotten gains, behind only arms smuggling and drug trafficking. It is the animals, however, that pay the price with their suffering and maltreatment. Don't buy an exotic animal for a pet. Wild animals need to thrive with members of their own species as they have complex behavioral, social, nutritional and psychological needs.They have lived for thousands of years without human interaction and they do not belong in your home with your children and other pets. While 'fatal attraction" might best be remebered as the title of a suspense thriller from a few decades ago, it also is an apt disclaimer that applies to the perilous possession of exotic animals.